Nuit Blanche happened this past Saturday October 1st from sundown to sunrise, or 6:58 pm to 7:00 am Sunday October 2nd to be exact. It was a smaller event this year with 90 exhibits but the crowds were as large as they’ve ever been. Having been wooed by pictures in the blogosphere and online, the first stop was in the West Queen West area. The Gladstone hotel held their own Stranger Things-themed dance party aptly named after the Netflix show where strange happenings are all-too common. Upstairs, for their independent “Fly by Night” exhibit, there were displays of local artwork that lined the corridors and filled up the second floor. It was encouraging to see the Toronto landmark full with arts enthusiasts for the all-night festival. 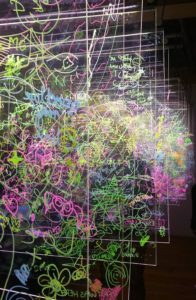 Held in the Ryerson Artspace in the Gladstone Hotel, there was an exhibit for “Stratatone-Prototype 2015”, where sightseers were invited to draw on glass with neon markers. The mechanized pencil draws a simple pattern continuously which helps replicate the message that within out interconnected world, there is miscommunication. It explored how a message that is continuously repeated breaks down, and becomes more abstract over time. Overall, the installation was interactive and fun although I do think the children surpassed the adults in their artistry. Next up was a stroll along West Queen West to the next destination at Trinity Bellwoods, which had throngs of spectators. The sound of music led us to the middle of a dance party in the park. 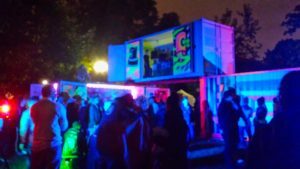 There were three large shipping containers, one stacked atop the others where DJ booths occupied the space. 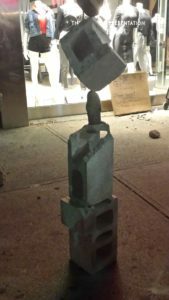 STAC’D merged architecture and art publically, promoting new ways to think about public art. 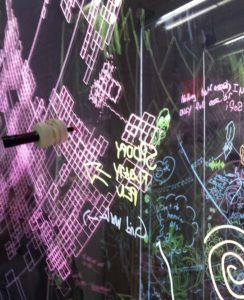 This installation was created with help from numerous artists and musicians including local artist Cruz1 and musician GOVI. Further along Queen Street, there were numerous street buskers out for the beautiful night. The rock-balancing act was a crowd favourite as it was mesmerizing to see how such heavy blocks could delicately sit atop smaller ones without falling. Clearly a metaphor for life, it could only work if each block was perfectly centered. 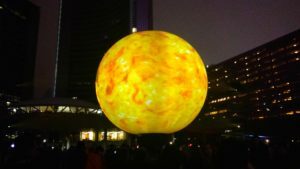 At the “Death of the Sun” installation at Nathan Philips Square, the giant sphere was projected with lights to symbolize the cycle of sun extinction. Additionally, plumes of smoke and various colours of differing ‘demise’ phases were enough to awe the crowds with the sheer size and beauty of the sun. Hopefully, this installation provoked reaction and debate on the ever-changing treatment of our planet, the intent of the director X, Julien Christian Lutz. Nuit Blanche 2016 was definitely an event to remember. Let’s take more time out of our busy schedules to salute all the hard-working photographers, designers, curators, artists, and musicians who enable us to think about the world through a different lens.